The NRA National Long Range Championship commenced Saturday, August 13 with the Band of Brothers Trophy Match followed by the Mustin Trophy Match. All Long Range matches are shot from the prone position from ranges between 800 and 1,000 yards. The Band of Brothers Match course of fire was twenty shots at 1,000 yards. Saturday’s second event, the Mustin Match, was also shot slow fire in the prone position from 1,000 yards. 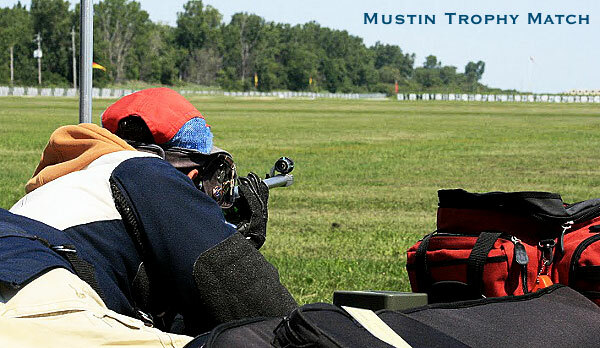 Mustin competitors have more time than during the High Power Championships, being allotted 30 minutes to get off their 20 shots for record on the Long Range targets. Photos, video and report courtesy The NRA Blog. Share the post "NRA Long Range Rifle Championship Is Underway"
Versatile now offers multiple models, with capacities from a single handgun up to 10 pistols. These can be purchased directly from Versatile, starting at $69.99, but other vendors sell them for less. 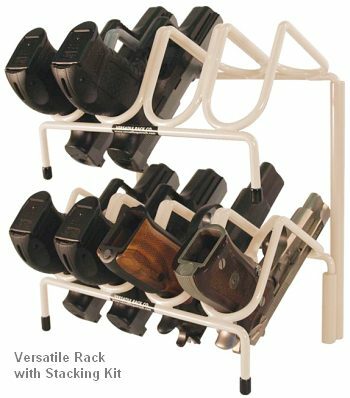 MidwayUSAhas Versatile racks at these price: $12.49 (2-gun, item 953403) $19.99 (4-gun, item 953075), $24.49 (6-gun, item 275638), $32.99 (8-gun, item 111468). Click HERE for a 360-degree view of the 4-gun unit. There is also an optional stacking unit, shown below. 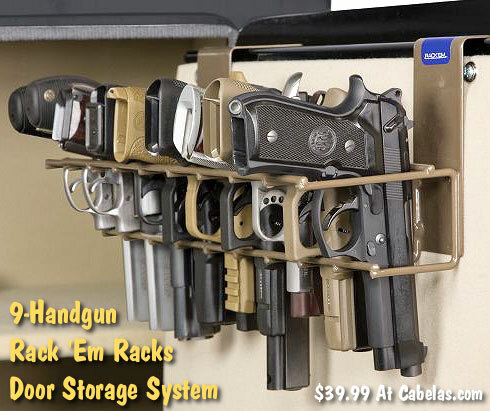 An even more efficient use of space is achieved with a two-tier “bunkbed-style” pistol rack. 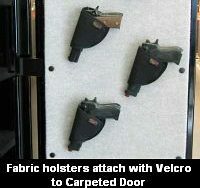 This will hold a large collection of pistols in a relatively compact space. 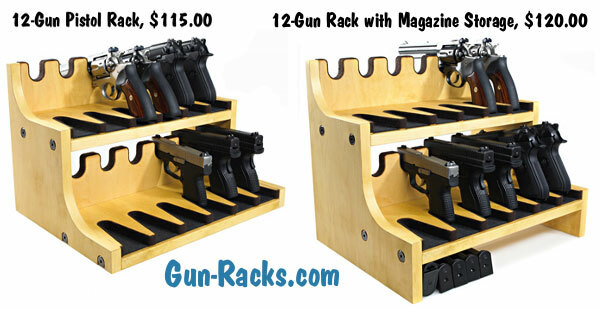 Gun-Racks.com offers two-tier pistol racks with 10-gun ($104.00), 12-gun ($115.00), or 16-gun ($125.00) capacities. For five ollars more (per size) you can get an elevated model with mag storage. 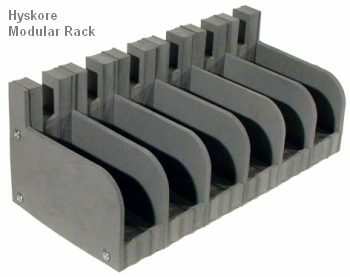 These racks are crafted from wood, with soft Rayon fabric on the sections contacting your guns. These well-made racks pack a lot of guns in a small space. However, the barrel slots are only 2.5″ apart. So you do get a very compact footprint, but the trade-off is a tight fit on larger handguns. Share the post "Handgun Storage Options for Your Gunsafe"
We know that many of our readers are 55 years of age or older (or soon will be). Your Editor just hit the 55 mark this year. But growing old isn’t all bad — many companies offer discounts for seniors. The threshhold age for discounts can range from 50 to 66, but for many programs, persons 55 or older qualify. A list of 106 companies offering senior discounts has been compiled by BradsDeals.com. On the list, you’ll find savings on groceries, restaurant meals, clothing, hard goods, cell phone plans, park admissions, hotels, car rentals, air travel and even personal services such as haircuts. We know you guys traveling to matches can benefit from the hotel and rental car discounts. CLICK HERE to download Senior Discount Company List (PDF). U.S. National Parks: $10 lifetime pass; 50% off other services including camping (Age 62+). Albertson’s: 10% off first Wednesday of each month (55+). American Discount Stores: 10% off every Monday (50+). Modell’s Sporting Goods: 10% off (55+). Rite Aid: 10% off on Tuesdays & 10% off prescriptions. Alamo, Avis, and Hertz Rent-a-car: Up to 25% off for AARP members. Clarion, Comfort Inn, Comfort Suites: 20%-30% off (60+). Holiday Inn: 10%-30% off depending on location (62+). The above list is just a small sampling of the senior discounts available. Download the entire list to see 106 companies’ senior savings programs (with eligibility requirements). You can find more discounts at www.SeniorDiscounts.com. In addition, since many senior discounts are not advertised to the public, folks over 55 should ALWAYS inquire (before you hand over your credit card) whether the store or vendor provides a senior discount. That way, you can be sure to get the most bang for your buck. Even if you only save $1.00 on a cup of coffee, that’s money saved that can be used to pay important bills, or used to buy more reloading components. Share the post "Over 55? Save Money on Meals, Gear, and Travel Expenses"